When you are in Boston we have different party bus models to rent out for diverse group travel requirements. You could hire one of our bus rentals for parties that make any event a great success. If you are a group of friends considering traveling together to a prom night event, book one of our party coaches. It will help you make the occasion even more fun and you might simply decide to party on board our bus. The rates being reasonable many even take up luxury limos that we put up for hire. 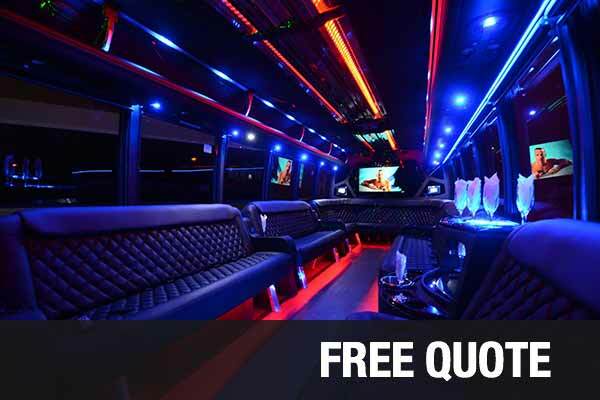 It is easy to hire one of our party bus rental Boston vehicles when you are in town. For instance, there are different coach models that can be used for diverse travel requirements. If you are unsure about the right coach type to hire, simply place a call at our agency. We will guide you through the selection process. Whether you are looking for a bus party or to get a ride to the airport and back, we have motor coaches, shuttle buses, passenger party buses and charter buses for hire. These can accommodate passengers from 14, 20, 30, 40 or 50. Choose a model as per your requirement such as bus rentals for trips. Besides party buses, we have different limos and cars available for hire through our limo service Boston. These can vary from Cadillac Escalade, Hummer Limos, BMW, Ford Excursion, Chrysler 300, Lexus and other car models like Mercedes-Benz. You will surely love the ride in a premier car when you are planning a wedding or a visit to a concert in town. For special occasions like prom nights rent a limo for cheap from our agency. These come at affordable rates. The shuttle buses are also suitable for small groups of people up to 14 in number. There are different kinds of packages we offer for diverse travel requirements of our customers. These can be suitable for celebrating different occasions like birthday parties or bachelorette parties. The prices we offer depend on the models that we have to hire besides the seating capacity, hours of booking, distance of travel and party facilities to be used on board. You can avail of discounts on these rates as well. Faneuil Hall; it is a meeting hall as well as a marketplace to visit. Freedom Trail; it is a walking trail in the region that is popular with tourists. New England Aquarium; there are over two thousand exhibits of animals to check out in this ocean tank. Museum Of Fine Arts; it is a place with historic art exhibits that are worth checking out. These places can be easily visited with our party bus rentals for trips. You will be able to have a customized tour of the region.